This article explains the function of 'Parallel Shader Compilation Allowed' available in Mari 3.3 and Mari 3.4, and what to expect when the option appears greyed out. Parallel Shader Compilation is a new feature that was introduced in Mari 3.3v1, that allows artists to use several different Shader Compilation Modes in order to benefit from viewport optimisation and better overall performance. The 'Parallel Shader Compilation Allowed' option does not actually determine whether or not you are able to use Shader Compilation modes within Mari. Instead, this preference simply displays whether or not the NVidia driver you are currently using has an extension that allows Mari to spilt processes between multiple threads in order to compile the UI and Shader separately, resulting in a more streamlined performance. When using 3.3v1, you may find that the 'Parallel Shader Compilation Allowed' and 'Parallel Shader Compile Threads' options are disabled in your Mari preferences. 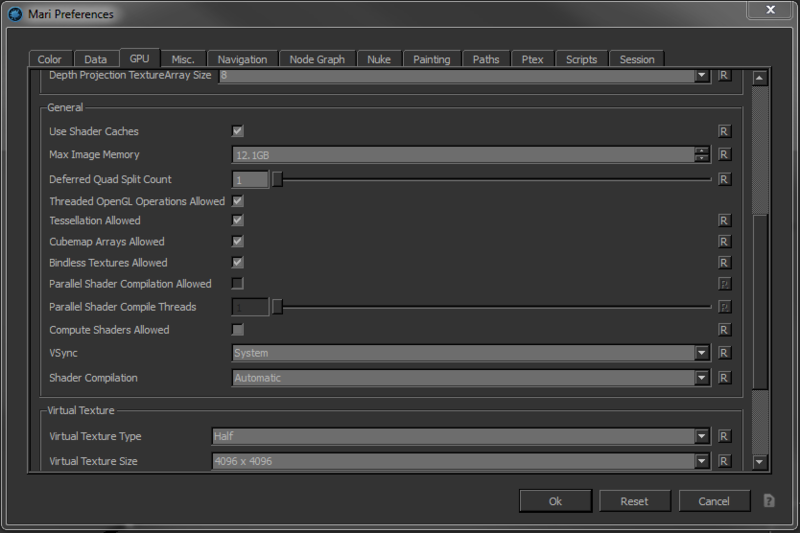 If you find that these options are greyed out, as long as your machine meets the minimum Graphics Driver requirements, you should still be able to take advantage of the 'Automatic' Shader Compilation mode which optimises Mari's performance and minimises waiting times. You should double check this by ensuring that you are able to change to 'Automatic' mode in the Shader Compilation preference, per the above screenshot.